Eat nutritious and stay healthy is the top Fitness mantra these days.. Everyone here want to stay fit and healthy, hence a good diet is really necessary... But when you are in a strict diet, hunger always pinch very badly. 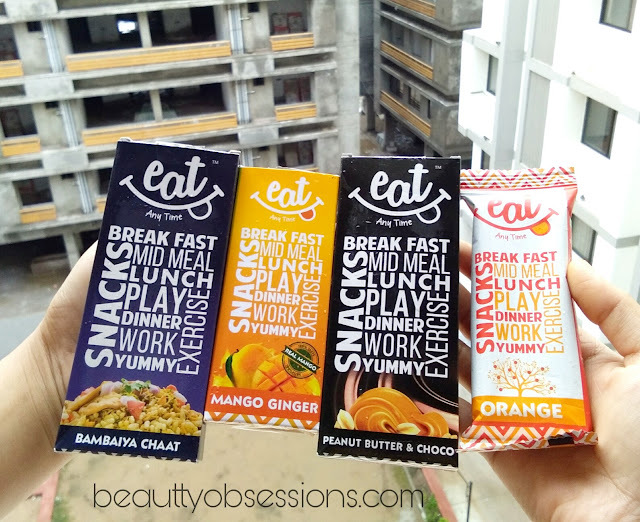 It is said that 'when you are feeling hungry, eat something nutritious not calories ' and I completely agree with this statement..
Now a days I am on diet to loose few extra kilos obviously and being a great foodie, it is really difficult for me.. Few days before I came across a brand Eat Any Time which make healthy and nutritious snacks bars in different flavors... I was super excited and quickly checked the ingredients and other details online and these are available on Amazon (here)..
PRICE - RS 50/- for 38gm. and 40gm. 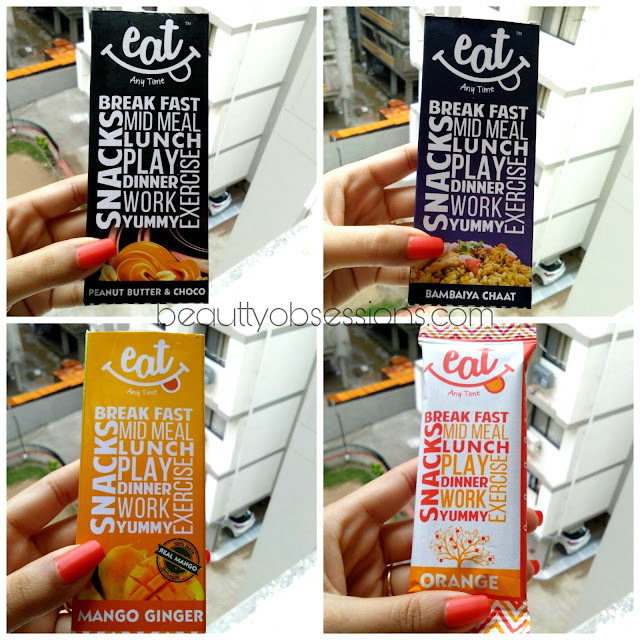 The snacks bars I have received are PEANUT BUTTER & CHOCO , MANGO GINGER , ORANGE and BAMBAIYA CHAT . 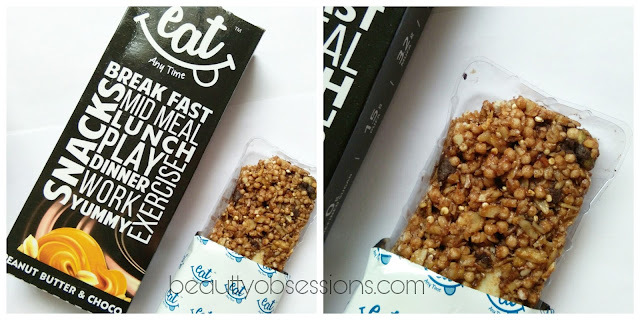 As per the brand's claim these snacks bars are healthy and nutritious bars ,and somehow i agree with that claim.. 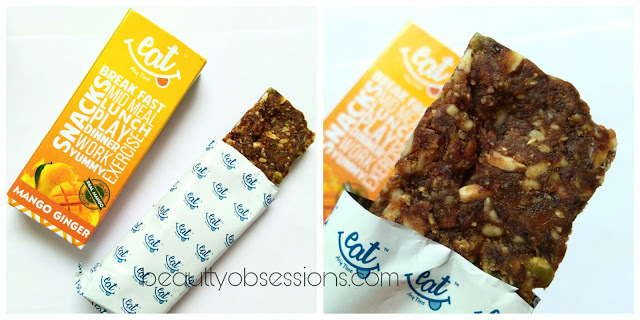 There are so many awesome ingredients in these bars like oats,quinoa seeds,pumpkin seeds, sunflower seeds, almond ,pre-biotic fibre, rice ,honey, peanut ,wheat flakes, ginger, black dates,etc.. Except all these most importantly there is no added sugar which i appreciate more. All the bars are gluten free and trans-fat free , cholesterol free and saturated fat free. So one can eat without any tension of gaining weight.. I love the combinations they have chosen .. Mango-ginger is really a unique combination i must say.. 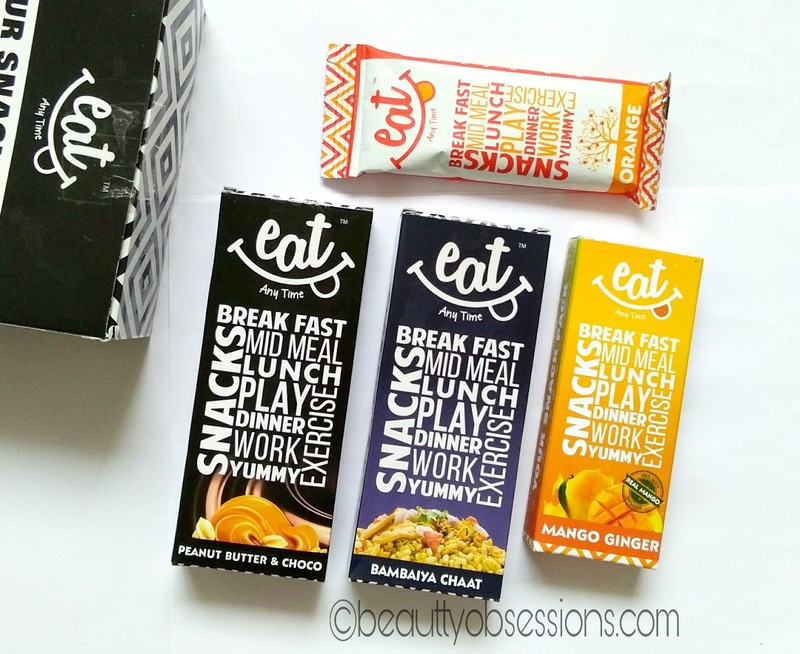 I have tasted all the bars personally and trust me these tastes awesome.. These are not sweet like the regular chocolates but there is no compromise on taste.. I would definitely prefer these healthy bars over regular chocolates. My favourite flavour is mango-ginger and peanut butter choco. The flavour bambaiya chat is a little spicy kind and the name itself is so tempting.. These are perfect to have in between meals and again a great option to carry while travelling .. One should not take these bars on regular or you can't substitute these to your regular meals and these are not meant for that obviously. 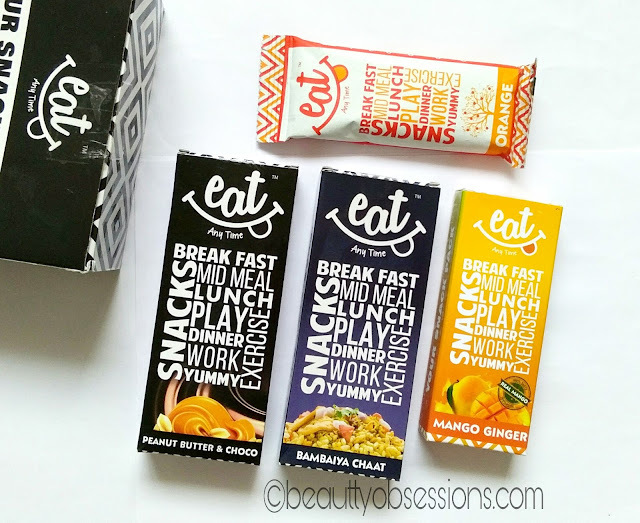 These bars have preservatives ,hence it is advisable to have twice or thrice a week just to bring changes in taste..
At last I must say these snacks bars are a perfect substitute of the regular chocolates or chips . Just try once ,you will love these..
Hope you found this post helpful..share your thought in comments below..
See you in the next post..bye.. 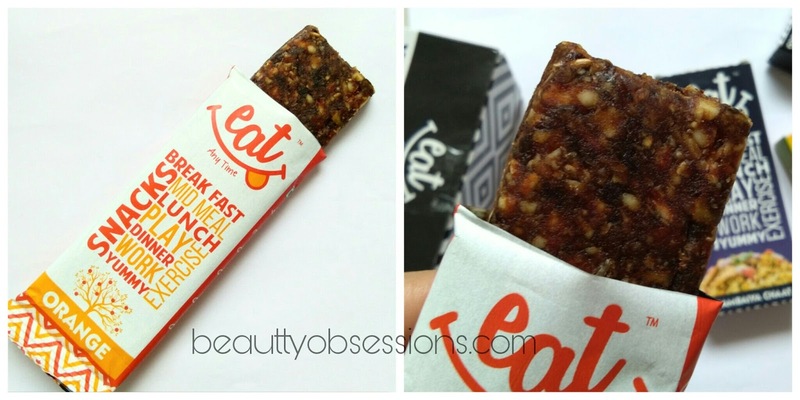 These type of energy bars are saviours. 😍 they totally save me going insane with in between meals hanger pangs. God the bars look yummy I am crazy for energy bars and so are my kids. will get them or my kids. 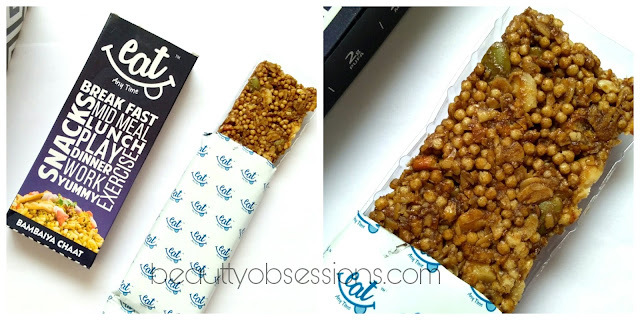 Would love to try them what is the calorie count per bar? Looks so healthy and yummy. Reminds me of Yoga bars. I really like their packaging though. Looks so yummy. These look really yummy and healthy too.I think these are good substitute for regular chocolate and chips. These bars look amazing..Very good replacement of chocolates.